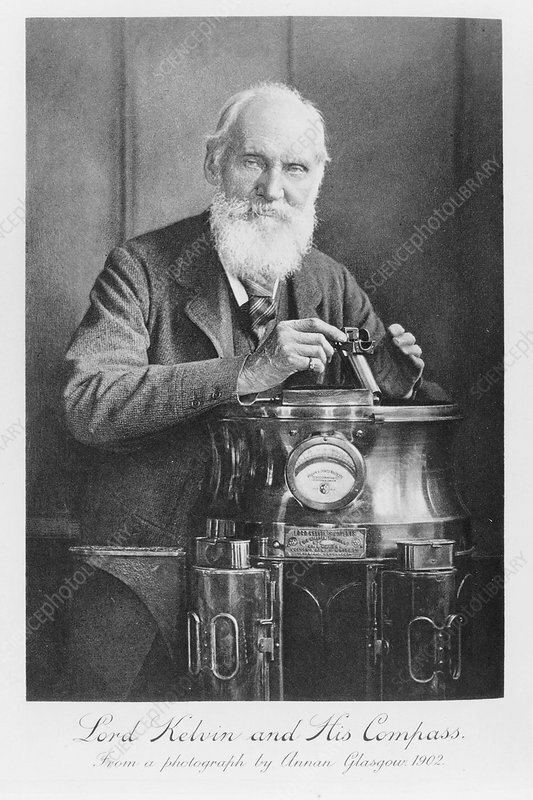 Lord Kelvin and his compass, 1902. Kelvin was born William Thomson and was educated at Glasgow and Cambridge. He was professor of Natural Philosophy (Physics) at the University of Glasgow for 53 years. Kelvin was a pioneer of thermodynamics and electromagnetic theory. He also directed work on the first transatlantic cable telegraph, which gave him considerable wealth. He was probably the first scientist to become wealthy through his work. He turned to improving his compass comparatively late in life. His compass had a very light card giving a long period of oscillation. It was mounted in a binnacle fitted with magnets and spheres and was much more accurate than previous compasses. Artist: James Craig Annan.